Baseball is played the way it is today, for better and worse, in large part because of the 2002 Oakland Athletics. They weren’t the first sabermetric team, but they were the first to spawn a book that sold nearly 2 million copies and was turned into a movie nominated for a Best Picture Oscar. Objective analysis always was bound to change baseball. “Moneyball” simply accelerated the timeline. Fifteen years isn’t a whole lot of time, not for a transformation as fundamental as the one baseball has undergone. It’s not just that the game is faster on the radar gun and slower on the clock. It is so deeply drenched in information that sometimes it feels waterlogged. Before “Moneyball,” scouting reports came from scouts. One longtime pitcher recently was talking about how every pitcher gets an individualized game plan on exactly how to attack every hitter, pitch by pitch. The 2017 Cleveland Indians are direct descendants of those A’s, not only because Wednesday afternoon they broke Oakland’s American League record by winning their 21st consecutive game and tied the 1935 Chicago Cubs for the longest streak ever. The Indians are Moneyball 2.0 – a team that embraced analytics but emphasized with them an organizational culture that runs from the bottom of their rookie-ball roster to the top of the front office. If the Indians are not the model organization in baseball today, they are close. At least one-third of the organizations in baseball include an Indians alum in a decision-making role of some manner or variety. Each, of course, would say the same thing about the team that has won 21 straight games: It’s a complete fluke. The Indians, if they’re being honest, would echo that sentiment. Baseball is not a game built for long winning streaks. The best teams win 60 percent of the time, the historic teams 70 percent. Before the streak, Cleveland was playing .552 baseball. The probability of such a team winning 21 straight games is 1 in 263,000. So, no, this isn’t a one-in-a-million team, not yet. It is one with a winning streak that can legally drink – and one that can set a record Thursday at 7:10 p.m. ET against the Kansas City Royals. In the meantime, here are 21 facts about the 2017 Indians, one for each victory. 1. Their winning streak is more impressive than Oakland’s. Not simply because it’s a game longer, either. The Indians have been better offensively. They’ve pitched better. And the numbers illustrate the game’s evolution, too. This is not to take anything away from Oakland. It hit .299/.367/.519 in its 20 games, whereas the Indians slashed .308/.387/.556 in theirs. The offensive environments, by the way, are about the same. In 2002, teams scored 4.62 runs per game. This season, it’s 4.67 – a steep rise due almost purely to the spike in home runs. The one area in which the A’s thump Cleveland is clutch hitting. With runners in scoring position, Oakland hit .374/.453/.631. The last three games of their streak came via walk-off hits – two of them home runs. Thing is, the Indians have so thoroughly dominated the competition, they haven’t found themselves in high-leverage situations. For that they can thank their pitching, which is where Cleveland truly differentiates itself. Both teams threw 180 innings in 20 games. The A’s ERA was 2.65. The Indians’: 1.60. Cleveland has throttled hitters far more effectively than A’s pitchers, and though this has as much to do with era as it does skill, the Indians’ strikeout rate dwarfs Oakland’s by more than 50 percent. The verdict: The A’s may have the Brad Pitt movie, but the Indians have scoreboard. 2. Their winning streak is more impressive than the so-called record, too, because it’s an actual winning streak. Look, the debate over whether the 1916 New York Giants’ record of 26 consecutive wins counts is interesting. (Yahoo’s Chris Cwik does a nice job of covering it here.) In the midst of the Giants’ streak, a game got called on account of rain when it was tied. Rather than continuing the game, it was replayed. The Giants won that and another 13. Officially, because the tie didn’t count, the Giants’ streak – and the record recognized by Major League Baseball – is 26 consecutive wins. The league’s official historian, John Thorn, agrees with that assessment. What’s difficult to reconcile is that the Giants played nine innings of a game … and the record books act like that game never existed. It did. It ended in a tie. And just because the tie was not made official does not negate the tie from having happened. The Giants played a game. They did not win it. To say they had an unbeaten streak is entirely appropriate and accurate. To call theirs a winning streak is to ignore the game Sept. 18, 1916 against the Pittsburgh Pirates that ended 1-1. 3. They’ve hit more home runs during the streak than they’ve allowed runs. This is one of those crazy numbers that personifies Cleveland’s dominance over the past three weeks: 41 home runs hit, 35 runs allowed. 4. They’ve played 189 innings during the streak and trailed in just four. That, too, speaks for itself. Cleveland’s run differential is now at +104 – 139 runs scored to 35 allowed. In other words, an average score of 7-2. 5. They’ve done this without two of their best players. Andrew Miller might be the best relief pitcher in baseball. If not, he’s certainly in the top 5. As much as anyone, he helped the Indians reach the World Series last season. A knee ailment has sidelined him since Aug. 21, three days before the streak started. He could come off the disabled list for Thursday’s potential record-setting game against Kansas City. Michael Brantley, on the other hand, won’t be back anytime soon. The 30-year-old All-Star had come back with aplomb after missing almost all of the 2016 season with a shoulder injury. This year, the offending body part is an ankle that has kept him out since Aug. 8. The good news for the Indians: Their outfield depth is one of their great strengths, enough that the likely season-ending hand injury to rookie center fielder Bradley Zimmer can be patched over without too much of a loss. 6. They’re going to set a record for strikeouts by a pitching staff. The record for strikeout rate was set last year by the Los Angeles Dodgers, who punched out 9.35 hitters per nine innings. Five teams have higher K/9 rates this year, including the Indians, who are at an incredible 10.04 per nine. That’s on pace for more than 1,600 strikeouts, nearly 100 ahead of the Dodgers in 2016. By the way, Indians pitchers have the lowest walk rate in baseball, too. 7. Their hitters, on the other hand, do not strike out. Only Kansas City has struck out less than the Indians’ 16 percent K rate during the streak. On the season, Houston is the lone team stingier with punchouts. 8. They do, however, walk. Cleveland has walked in more than 10 percent of its plate appearances since the streak began. It’s one thing to have a team that doesn’t give away outs without leaving the batter’s box. It’s an entirely different one to possess plate discipline in both directions. The only team with a better walk rate than Cleveland’s 9.8 percent over the full season is the Dodgers. 9. They’re not the best offensive team in baseball because they haven’t been clutch. The home runs, the walks, the lack of strikeouts – one would think the Indians aren’t just the kings of runs allowed (which they are, with 518 allowed) but scored as well. The reality: Three teams alone in the American League – Houston, New York and Texas – have scored more runs than the Indians, and same goes for Washington and Colorado. How does a team with the second-best on-base percentage and third-best slugging percentage in the game wind up sixth in runs scored? Well, they’re a bottom-third OPS team with runners in scoring position, so that explains some of it. Get a little more granular, look at their numbers in high-leverage situations and it explains most of Cleveland’s issues translating excellence into production: The Indians have hit .197/.279/.296 in big spots (as explained here). Houston’s .548 slugging percentage in such situations is almost as big a number as Cleveland’s OPS. Now, this doesn’t portend trouble for the Indians. Production in situations of varying leverage offers no prognostication of future production in the same situations. It’s not that they won’t be clutch. It’s just that they haven’t been. 10. They hadn’t allowed a single unearned run during the streak until Wednesday. The Indians aren’t a team known for their gloves. Scouts consider them average, maybe slightly above. Metrics peg them about the same. What they do, though, is limit errors, with the second fewest in baseball, and save their pitchers from precarious positions with undeserved baserunners. Third baseman Yandy Diaz’s error to lead off the sixth inning preceded a pair of runs, the first of an unearned variety charged to the Indians since Aug. 17 – a week before the streak started. 11. Their ace is not human. Corey Kluber’s true identity – he is a robot – is fairly well-known. Since the beginning of the streak, he has thrown 32 innings, struck out 35, walked two and put up a 1.41 ERA. And you can argue he hasn’t even been their best starter: Carlos Carrasco, who missed the playoffs with an injury last season, has 34 strikeouts against one walk over 29 innings with a 0.62 ERA. Altogether, Indians starters are 19-0 with a 1.70 ERA, 134 strikeouts and 25 walks over 132 innings. Take out Danny Salazar’s 2/3-inning, four-run implosion and the ERA is 1.44. 12. They love to throw curveballs. Nobody throws more curves than the Indians, who spin them on nearly 17 percent of pitches. Closer Cody Allen throws his hard curve nearly half the time. Lefty Tyler Olson loops in his slow bender almost 40 percent. All five Indians starters throw curves, too, and though Kluber’s is the best, Trevor Bauer has bumped his usage to nearly 30 percent and seen great strides. 13. They love to throw cutters, too. At 13.2 percent, the Indians are the cut fastball-heaviest team in the game as well. And between that and their curveball usage, it shows how they throw the second-fewest fastballs in the major leagues. Less than half of the Indians’ pitches are fastballs – just 48.9 percent, second to the Yankees, whose 44.6 percent fastball rate may well be the lowest of any major league team in history. 14. They’ve got the best bullpen in baseball. Nobody is going to mistake Miller, Allen, Olson, Bryan Shaw, Joe Smith, Zach McAllister, Nick Goody, Dan Otero and others for some overpowering, dominant gang that lives to pillage. The Indians have a bit of everything: the power arms and finesse guys, the strike throwers and junk spinners. They strike out a lot of guys, don’t walk many and keep the ball in the stadium. During the streak, they’ve struck out 58 in 57 innings, walked 11, given up just 39 hits and posted a 1.26 ERA. On the season, their 2.82 ERA is nearly half a run better than the next-best bullpen, Boston’s. 15. They’ve thrown seven shutouts in the streak. That really needs no explanation. 16. They haven’t given up more than four runs in three weeks – since the first game of the streak. The Boston Red Sox took two games of their series in Cleveland from Aug. 22-23, and with Chris Sale, the greatest threat to Kluber’s Cy Young candidacy, pitching in the series’ final affair, they felt good. By the end of the third inning, the Indians had lit Sale up for seven runs – his ERA this year against Cleveland: 14.63 – and were on their way to putting up a baker’s dozen. Bauer yielded four runs and Goody a pair in garbage time. In the 20 games since, here are the run totals from Indians opponents: 0, 0, 0, 2, 1, 4, 2, 0, 2, 1, 3, 4, 1, 2, 0, 2, 2, 0, 0, 3. 17. They haven’t wasted any time in pouncing on teams during the streak. Jay Bruce’s three-run homer in the first inning Wednesday was the latest example of the Indians ambushing opponents early. It was the Indians’ eighth first-inning homer. In the first and second innings during the streak, they have batted over .375 and slugged better than .700. Their run differential in the first and second innings alone: 56-10. 18. They have hit as well with two strikes than any team this year – and especially during the streak. Rare is the hitter who succeeds with two strikes. The pitcher simply finds himself at too big an advantage. So while a .233/.331/.389 line doesn’t sound like much, to put up those numbers on two-strike counts during the streak is almost inconceivable. The league over the same time period: .188/.258/.313. 19. They have used only one player in all 21 games – and you probably have no idea who he is. Giovanny Urshela is a 25-year-old infielder whose glove and arm at third base have gotten him shots at the major leagues in 2015 and this season. He has been, by the measure of Wins Above Replacement as calculated by FanGraphs at least, the single worst player on the Indians this season. And yet there he was again Wednesday, a seventh-inning defensive replacement, the 13th time during the streak he has arrived late in the game to shore up the infield. Add that to his eight starts, and Giovanny Urshela has played more games than MVP candidate Jose Ramirez, more games than franchise player Francisco Lindor, more games than free agent coup Edwin Encarnacion. Every streak has its oddity, and the ubiquity of Giovanny Urshela surely qualifies as this one’s primary candidate. The Cubs of 82 years ago were really good. Before they won 21 in a row, they had put together an 11-game winning streak, a stretch in which they won 16 of 17 and a month-or-so-long period that saw them take 24 of 27. They had Hall of Famers at catcher (Gabby Hartnett), outfield (Chuck Klein) and utility (Fred Lindstrom). Future MVP Phil Cavaretta was an 18-year-old rookie. Their pitching staff went only six deep but had an ERA of 3.26, more than 20 percent better than the rest of the league. During their 21-game winning streak, the Cubs outscored opponents 137-50 – and that included an 18-14 game that, if excised, would put them awfully close to Indians territory in terms of run prevention. During the streak, they beat Carl Hubbell and Dizzy Dean. It ended Sept. 28, 1935, in the second-to-last game of the season, in the 11th inning, after they’d clawed back for three runs in the ninth inning to tie the game. The Cubs would lose the next one to the Cardinals, too, and start the World Series three days later. In it they faced the Detroit Tigers of Hank Greenberg, Charlie Gehringer and Mickey Cochrane, and for the fifth consecutive World Series, they lost. They would drop two more, and seven postseason series after that, before 2016, when they beat the Cleveland Indians in extra innings in the seventh game. 21. They have a shrine to Jobu. 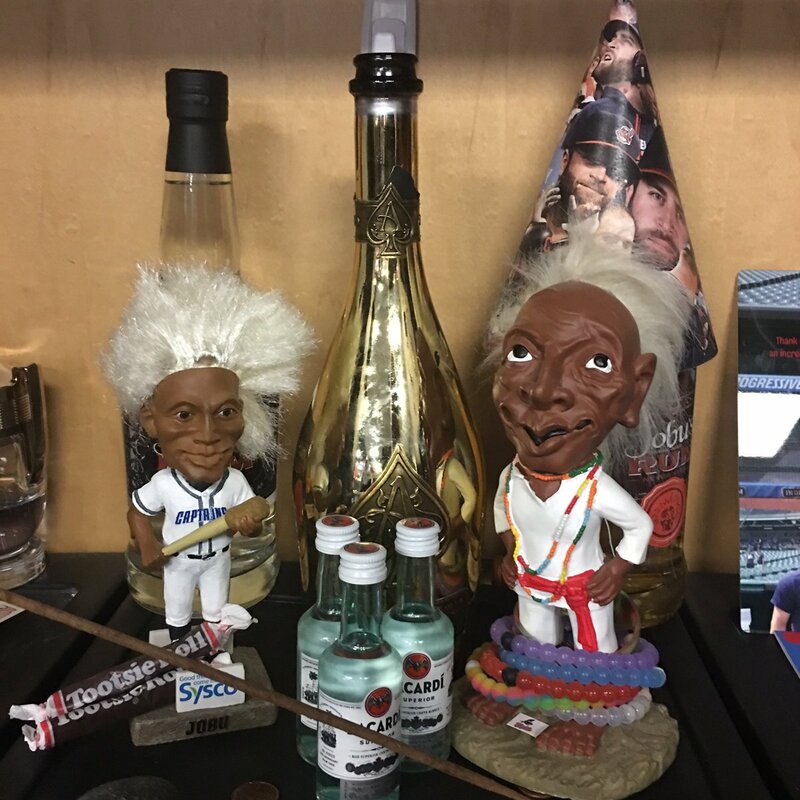 As long as nobody steals Jobu’s rum, this streak may go on forever.